Some recent thoughts and discussions have made it clear to me that something is missing from the new BC Social Studies curriculum. Up until now I was not sure if it was something personal and connected missing from the curricular competencies, a mechanism by which Aboriginal perspectives could enter more fully into the classroom conversation, or an practical extension of the core competencies into the learning standards. Turns out it is at the centre of all three. For those uninitiated into the vast realm of education jargon, I will explain these ideas bit using Social Studies as a context. Curricular competencies are the skills and strategies that students develop in order to approach problems of history, place (geography), and other topics that come up in Social Studies. They include research skills and inquiry abilities. The competencies include variations of six historical thinking concepts that are well explained at The Historical Thinking Project and also at The Critical Thinking Consortium. These "Big 6" are sometimes described as establishing significance, working with evidence, continuity and change, cause and consequence, taking perspectives, and ethical dimensions. I believe there are two important things missing from these competencies -- language that extends historical thinking into the area of geographic thinking, and the skill/space/support for students to make authentic and meaningful connections to their learning, the Social Studies content, and the other skills they are developing. Regardless of the fine-tuning, the competencies represent an academic approach to the study of Social Studies, capable of being post-colonial and culturally sensitive, but nonetheless a modern (if not fully modernist*) incarnation of the positivist tradition in education. The curricular competencies, starting with inquiry and working with a variety of critical thinking concepts, get students to the edge of answering "so what" questions in Social Studies. *Update: an expert on both the new curriculum and Big 6-derived competencies has pointed out that the Historical Thinking Concepts have been profoundly affected by a turn towards post-modernism (presumably among the academics who developed them for use in education). This in itself is a interesting discussion but I'll leave it at that for now. 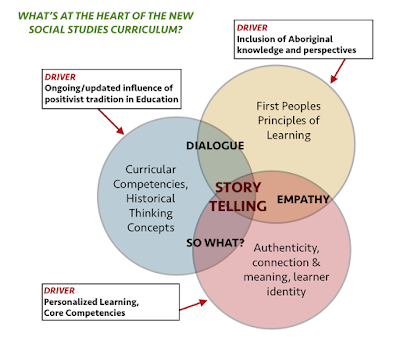 The new curriculum emphasizes the opportunity to include more Aboriginal perspectives and knowledge, in some ways a challenge to the positivist tradition and in other ways a means to embed alternate views and powerful stories alongside the empirical approach and a Eurocentric narrative. In parts of the curriculum these opportunities are made clear, and in others it is not. What is missing is some mechanism whereby this emphasis can be layered and interactive with the competencies -- and does more just establish a quota for Aboriginal content. There are many ways in which indigenous perspectives can become more responsive with the Social Studies class. I feel as if I am only starting down this path and have much to learn (see Q6/A6 on this post about Social Studies 9). A good starting point for teachers in the same position is the First Peoples Principles of Learning. If you want a interesting thought experiment, read these principles and then read the curricular competencies for a new BC Social Studies course. What's the connection? For me, it is as if the FPPoL represents the reasons why developing the competencies is important work and to end they should lead. Each Social Studies course could be subtitled with Principle 2, 3, 6, 7, or 8, e.g. "Learning is embedded in memory, history, and story." In providing a framework for the new curriculum and "personalized" learning, the Ministry of Education and teacher teams developed the Core Competencies. "[A]long with literacy and numeracy foundations and essential content and concepts," these aver-arching standards "are at the centre of the redesign of curriculum and assessment. Core competencies are sets of intellectual, personal, and social and emotional proficiencies that all students need to develop in order to engage in deep learning and life-long learning" (https://curriculum.gov.bc.ca/competencies). One of the three core competencies is Communication. There is obvious importance in all course and grades to the various ways in which students interpret prompts, engage in activities, express their understanding, show their learning, and collaborate with others. Where "Communication" could be more practical is at the level of curricular competencies, the discipline-specific skills and strategies that guide exploration of content in each course. What is an actual ability that can be employed alongside interpretation of bias, perspective-taking, and establishing chains of causality in Social Studies? 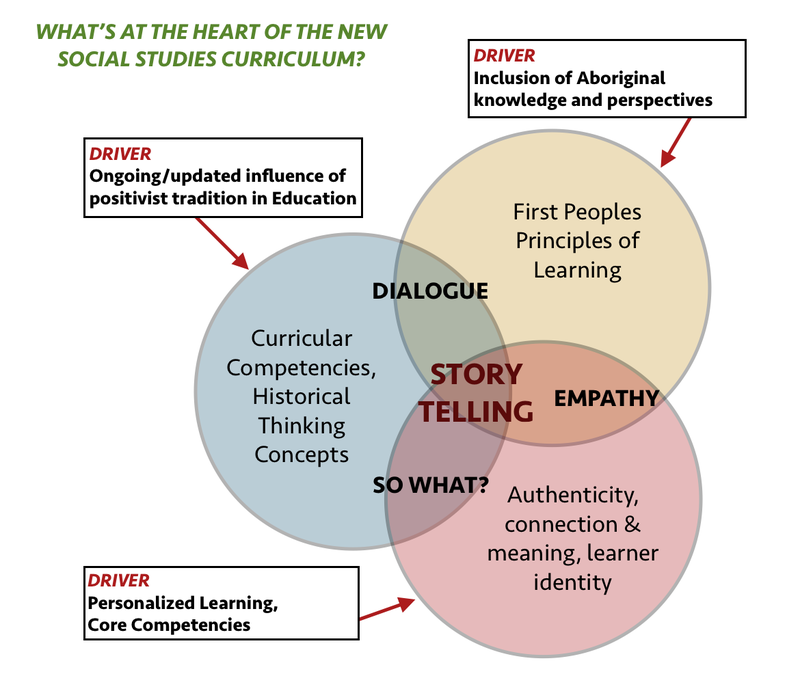 I believe that all three of these "problems" -- incomplete curricular competencies, inclusion of Aboriginal perspectives, and the need to explicitly apply core competencies -- centers around storytelling. This is skill, a competency, an arena for discovery, and a way of beginning difficult conversations, that has always been indispensable in the Social Studies classroom. I'd like to see storytelling included more prominently in the new curriculum. Read a few of the student stories on this blog post to see my own bias on the importance of storytelling. Maybe one day there will be a Storytelling 12 that leverages interdisciplinary learning from K-12 and allows students to tell their stories. I think it would be a fitting way to finish high school and honour their diverse paths towards success. For now, Storytelling will be an unofficial curricular competency and will be the main strategy with which teaching and learning in my Social Studies class get the heart of the three problems I have described above. For the visual learners out there, I have summarized and represented these thoughts in a graphic below.